Marchionne says Fiat's European lineup wouldn't fit U.S.
Fiat will not send more Italians to Chrysler but some Chrysler gasoline-engine experts could move to Turin, Marchionne said. TURIN, Italy — Despite all the talk of new Fiat-based cars, the Fiat-controlled Chrysler Group expects to keep a truck-heavy vehicle mix similar to today's lineup. "I think it will be very stupid for us to assume the same type of European style and sizing which has driven the automobile portfolio of Fiat Group will prevail in the U.S.," Chrysler and Fiat CEO Sergio Marchionne told Automotive News. Assuming a relatively unchanged vehicle mix dominated by full-sized pickups, SUVs, large cars and minivans, plus 25 percent better fuel efficiency through Fiat's advanced engine technology, Marchionne said Chrysler will achieve up to a 7.7 percent operating profit margin on revenue by 2014. • The new broadened Ram truck brand will be a main engine of profit, just as Ram pickups were before the name was elevated to a separate brand covering pickups and commercial vehicles. At Fiat Group Automobiles, the Fiat Professional brand for commercial vehicles is the most profitable. • Jeep will continue to expand beyond rugged four-wheel-drive SUVs, despite lackluster results by DaimlerChrysler and Cerberus Capital Management, the previous owners of Chrysler, with such vehicles as the Patriot and Compass. • Engine technologies from Fiat, such as Fiat's MultiAir air management system, will be used in Chrysler's four-cylinder and V-6 engines to increase fuel economy in nearly all segments. Some Chrysler models will offer Fiat diesel engines, probably starting in Canada. • Chrysler's managers will have significant autonomy to run their operations. There are no plans to send more Italians from Fiat to Chrysler, and some Chrysler gasoline-engine experts could move from Auburn Hills to Turin, Marchionne said. Five of the 25 Chrysler executives who report to Marchionne moved from Fiat. Marchionne's goal of a 7.7 percent operating margin would match Chrysler's profits in 1997, the last full year before the acquisition by Daimler-Benz, when Chrysler posted operating profits of $4.7 billion on revenue of $61.1 billion. While Marchionne says Chrysler's mix will change little under Fiat's direction, reality could intercede. For example, if gasoline prices increase sharply, demand for small Fiat-based Chrysler vehicles could increase. And Marchionne has a history of reshuffling product plans. But the current product plan, laid out at Marchionne's nine-hour briefing on Nov. 4, plays to Chrysler's strengths. Small cars traditionally have been a tough sell in the United States. And the brand images of Chrysler, Dodge and Jeep have been built on power, performance and ruggedness. Marchionne said Chrysler will sell small cars in the United States, such as the Fiat 500 and new subcompacts, "but I still think the heart of the U.S. market would continue to be in the C and D segment." The C and D segments are compact and mid-sized cars, such as the Honda Civic and Accord. Chrysler's entries in those segments — the Chrysler PT Cruiser and Sebring and the Dodge Caliber and Avenger — are weak sellers. Through October of this year, combined sales of the Sebring and Avenger totaled just 51,531, dwarfed by the 244,579 sales of the Accord alone. 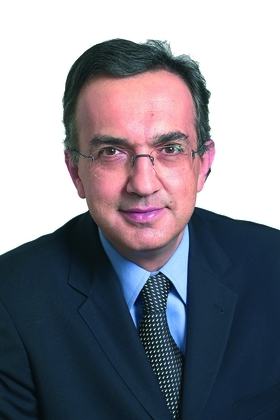 Marchionne's Chrysler plans four new C and D vehicles debuting in 2012 and 2013. At the end of next year, Chrysler will give the Sebring a new front end, rear end, interior and improved handling, which Marchionne is confident will reverse the current sales slide. For Jeep, the company will continue efforts to attract mainstream buyers who like the brand's image but don't go off-road. The automaker plans in 2013 to produce two all-wheel-drive crossovers based on Fiat-derived platforms, including a subcompact based on the Fiat Panda, which is slightly smaller than the little Honda Fit. Marchionne says Jeep's traditional position as the trail-rated, pure off-road brand was too limiting. "Staying in the corner where it stayed, Jeep has allowed everybody else to occupy a space which probably does not belong to them," he said. "We have to go back and reclaim that territory." In 2012 and 2013, Chrysler plans to sell 14 nameplates based on Fiat-derived platforms or rebadged versions of Fiat vehicles. Most are small or mid-sized. Marchionne flies regularly between Turin and Detroit, commercially if he's by himself or on a company-leased airplane if he's in a group. Counting both Fiat and Chrysler executives, he will continue to oversee nearly 60 direct reports. He does not plan to appoint COOs for Chrysler or Fiat. He said he plans to split his time between Europe and the United States next year.